at two intersections in the borough. METUCHEN — Members of Girl Scout Junior Troop No. 81460 have taken a stand on pedestrian safety and helmet safety to earn their Bronze Awards. The girls — Maya Soloman, 10; Carly Newcomb, 11; Melanie McNeil, 11; Alli Kodila, 11; Mackenzie Baker, 10; and Francis Lee, 10 — came together for their weekly meeting at the Community Nursery School on Woodbridge Avenue to discuss their project on Feb. 24. The troop is led by Lynn Fitzgerald Kodila and Heidi Haiken. Soloman explained that they are making fliers to hand out to the public that will provide safety tips on how to cross at crosswalks, and stress the importance of wearing safety helmets. The Girl Scout Bronze Award, according to the Girl Scouts of Central & Southern New Jersey website, is the highest honor a Girl Scout Junior can achieve. 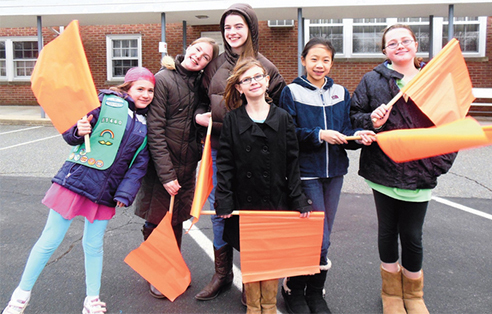 The scouts’ project comes right in time for the borough’s recently announced piloting of pedestrian flags at two borough intersections: Middlesex Avenue at Oak Avenue, and Main Street between Lincoln Avenue and High Street. Tyreen Reuter, a member of the borough’s Traffic and Transportation Committee and a proponent of pedestrian safety in Metuchen, attended the scout’s discussion and informed them about the flags. Reuter said more signs could be put up to make people aware of the flags, but the most effective way is to educate the public — and that is where the Scouts come in. The Scouts tested the flags in the parking lot of the Community Nursery School. Some said they believe it is a great tool when crossing the street, but others said they weren’t sure. Reuter said the flags are just another tool for pedestrian safety, and if all goes well, the borough will implement flags at other intersections. The scouts are also knitting blankets to donate to the victims of superstorm Sandy. They are following the concept from the Warm Up America! Foundation, a charity that started in 1991 when neighbors in a small town in Wisconsin started knitting and crocheting afghans for neighbors in need. Kodila said they are asking the community to donate knitted squares, which they will then piece together into blankets. 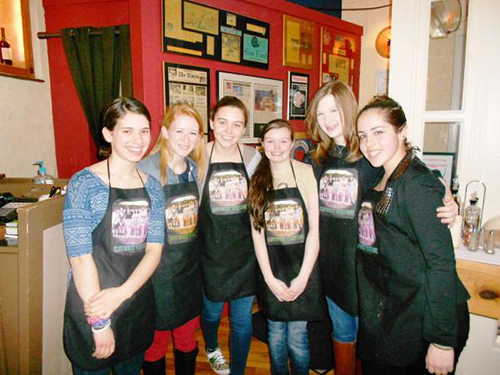 Members of Girl Scout Troop 80925, Flemington, work for their Gold Award at Tre Piani, Princeton. Shoppers at the annual Winter Slow Food Farmers Market held at Tre Piani restaurant in Forrestal Village last month may have noticed an unusual sight: a group of six teenage girls in T-shirts and jeans bouncing from table to table, debating which meats, cheeses, breads, vegetables, and other comestibles to select — and then gathering up enough to feed a small army. Well, at least the 25 people they were having over for dinner that night. At the restaurant. The girls, Hannah Barrett, Olivia Killian, Gabrielle Longchamp, Julia McDonald, Olivia Rios, and Emily Schalk, are members of Girl Scout Troop 80925 in Flemington, and their Tre Piani experience was but one leg in a group journey called Sow What? In Girl Scout lingo, a “journey” is a group of activities and accomplishments for older Scouts that, along with accumulating badges, culminates in a Gold Award — the equivalent of Eagle Scout for boys. Cathy Schalk, one of the troop leaders and mother of Emily, explained that the Sow What? journey “encompasses sustainable farming, slow food, and the nutritional importance of food to our health.” The girls began working on the project last summer visiting area farms and meeting with agriculture specialists and leaders of the slow food movement, including Jim Weaver, chef/owner of Tre Piani, who founded and heads up the Central New Jersey chapter. To thank him, the girls decided they would cook a dinner for the chef, in February. That’s how the scouts — five sophomores and one freshman at Hunterdon Central Regional High, several of whom have known each other since second grade — came to be shopping at the slow food market and, afterward, donning aprons and wielding 12-inch chefs knives in the restaurant’s kitchen. The menu started with salad of baby lettuces, Tre Piani’s own fresh mozzarella, local hothouse tomatoes, and croutons made with bread from Bobolink Dairy and Bakehouse, one of the day’s many vendors. The main dish was Penne Bolognese made with local grass-fed beef and sausage, mushrooms from Davidson’s, and fresh ricotta from Fulper Farms. The girls had made ahead of time and brought with them avocado chocolate mousse — a recipe of Food Network chef Giada De Laurentiis. They had found it on the Internet, they explained while expertly piping it into clear plastic cups and topping it with whipped cream. Some of these farmers were among the 25 friends and family members the troop had invited to share their Tre Piani dinner, among them a soil expert from Rutgers University and a Flemington school nurse who had founded a school garden. After everyone had tasted the pasta, Mr. Weaver says, “This dish just may have to go on the menu here at Tre Piani. We’ll call it ‘Pasta 80925.’ The only thing is, customers will expect Girl Scout cookies afterwards!" Clean the mushrooms by wiping with a damp paper towel. (Do not rinse: mushrooms soak up water like a sponge.) Chop mushrooms. Saute over high heat in small batches with 2 tablespoons of the olive oil and a little salt. The liquid released from the mushrooms should have enough room in the pan to evaporate and let the mushrooms develop a golden-brown color. Set aside. Heat the remaining oil over medium heat. Add the onion and some salt, and saute for about five minutes, until the onion is translucent. Then add carrots, garlic, chili flakes, and a little salt. Cook for another five minutes. Add the sausage and ground beef. Cook, breaking down the lumps with a fork, until the meat is cooked through. Add tomatoes, olive oil, and stock. Add salt and pepper to taste (not too much; the sauce will reduce and intensify). Reduce the heat and simmer for 20 minutes or, better yet, an hour. Add sauteed mushrooms and stir until heated through. Serve or refrigerate. The sauce tastes even better the next day. If you make it ahead of time reheat over low heat while the pasta is cooking. Just before serving take the sauce off the heat and mix in the ricotta. When ready to serve, cook the pasta according to package instructions then mix with the Bolognese sauce.